Subscribe as a Basic Seller and get 250 FREE business cards to promote your online store. 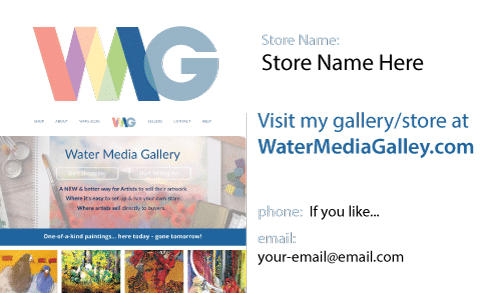 These business cards will help you promote your online gallery/store. Hand these out to anyone who says “hey, I hear you paint, is there a place I can see your work”? Then they can visit your online gallery – and maybe buy your work, or send link to a friend. It’s a great way to promote your artwork – and makes it really easy for buyers to fall in love with one of your paintings. * Once registered as a Basic Seller order business cards using this form. Through the end of this year, so don't wait! For “Basic or Advanced Seller” members only.